Left out in the rain! The on-camera flash is causing shadows and has washed out some of the color. The color combination is good. Overall the photo doesn't have a lot of impact but I wouldn't know what to say to help you get a better score. Even if natural light was used, I don't think this would be a high scorer because of the subject matter. 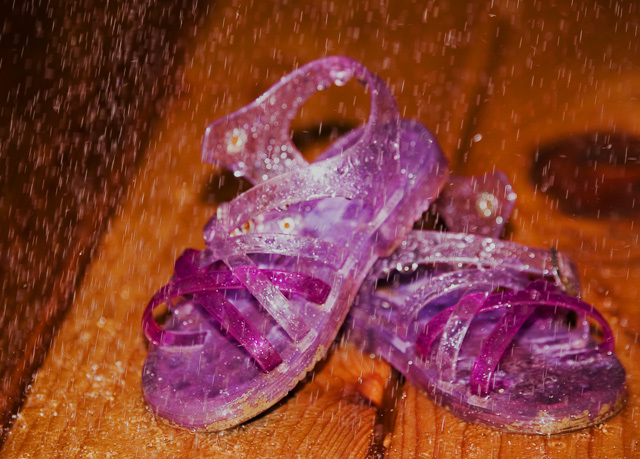 The rain looks a bit funny in this pic... it seems a too scattered and "small", compared to the sandals. Just doesn't look natural somehow... sorry, might be my eyes, but I find this shot a bit strange. Nice colours and idea. 7. Proudly hosted by Sargasso Networks. Current Server Time: 04/23/2019 08:36:29 PM EDT.